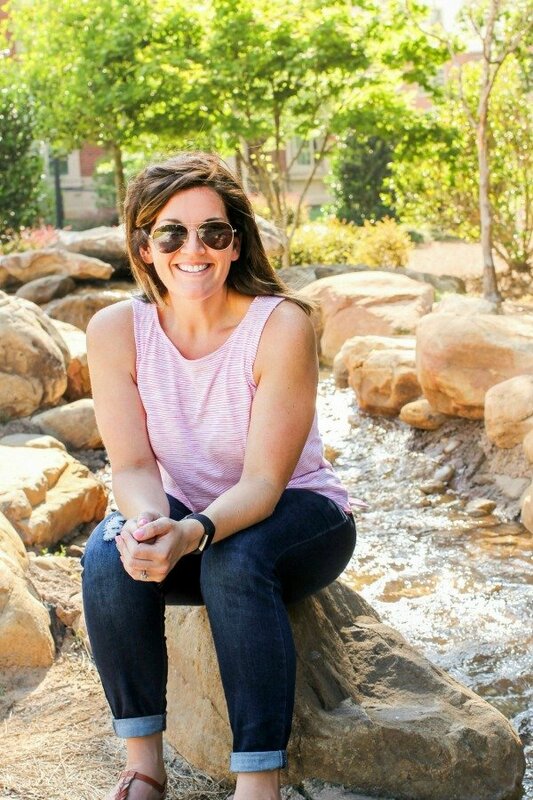 July 2, 2018 By Allyson 50 Comments This post may contain affiliate links. Read my disclosure policy. 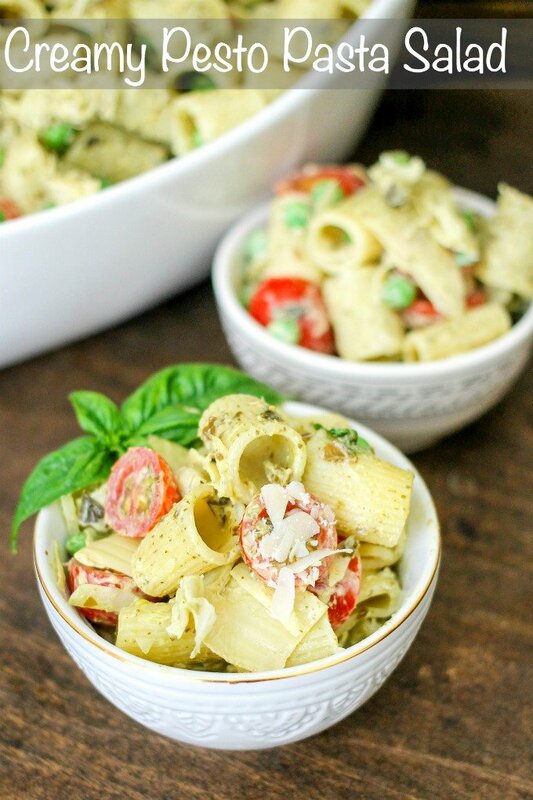 This Creamy Pesto Pasta is full of tomatoes, artichokes, peas, and topped with a creamy pesto sauce! It’s sure to be a BBQ favorite! 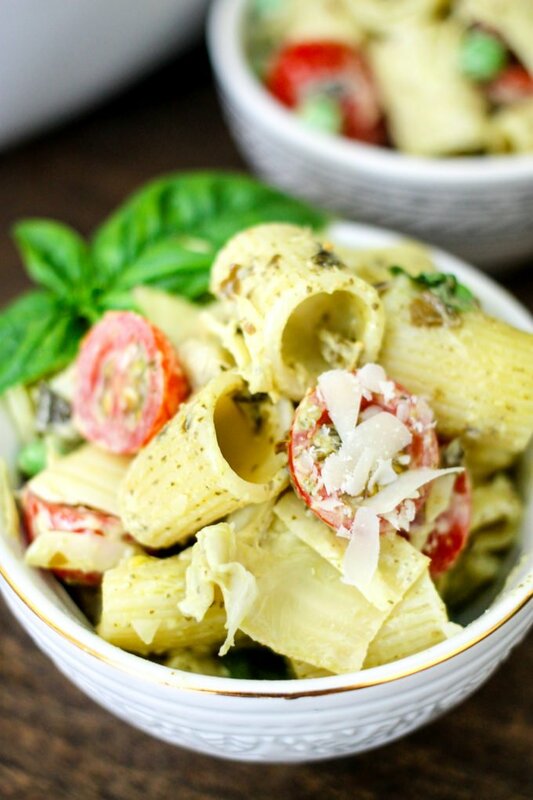 Creamy Pesto Pasta is perfect for dinner, BBQs, pot lucks, or a quick lunch. would be perfect for occasion. Use store bought or homemade pesto (recipe below), both work well in this recipe. Delicious fresh basil is readily available in the summer, or you might even have your own plant – use it! I like to make this salad the night before I will be serving it, then refrigerate it and serve the next day; the flavor is amazing! While the pasta is boiling, prepare the creamy pesto sauce, and prep the vegetables. Mix everything in a large bowl, making sure everything is coated in the sauce, then refrigerate until ready to serve. TIP: Use a stock pot to cook your pasta, then mix everything in the same big pot – it will make mixing SO much easier! 1 cup basil leaves, 1 TBS olive oil, 2 TBS pine nuts (or any nuts work well), 2 TBS parmesan cheese, pinch of salt and pepper. Place everything into a food processor, then process until combined. Scrape down the sides, then pulse a few seconds more. Store in a closed container in the refrigerator. 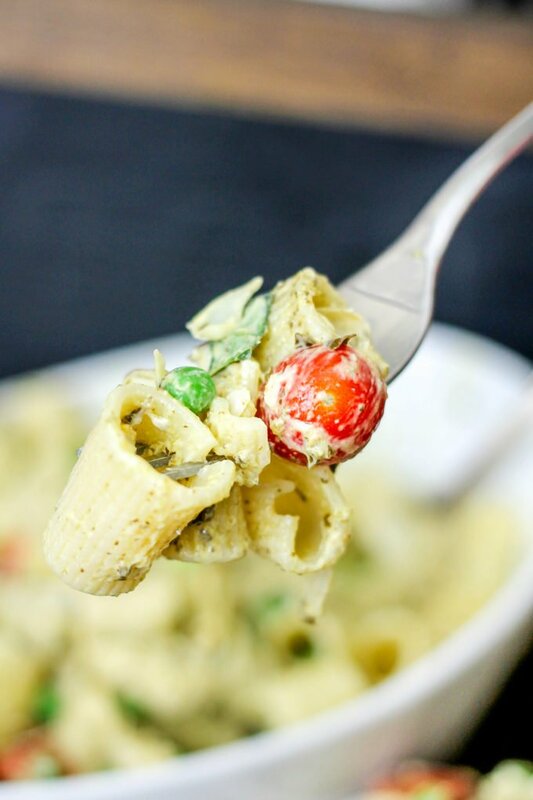 I like using tomatoes, peas, and artichokes in the this creamy pesto pasta, but if you don’t like a certain component, you can always substitute it with something else or leave it out. That’s the thing with pasta salad, you can pretty much throw whatever you want into it, and it will turn out delicious! Jalapeno Popper Stuffed Black Bean Burgers are deliciously cheesy, spicy hot, and protein packed black bean burgers! Perfect for the meatless grill option! Spicy Black Bean Avocado Burgers are spicy yet sweetened up with delicious honey BBQ sauce! Topped with a fresh avocado and pepper jack cheese – these are the perfect burgers! Spicy Black Bean Hawaiian BBQ Burgers will be a hit at your next BBQ, and even the meat eaters will be asking for this recipe! 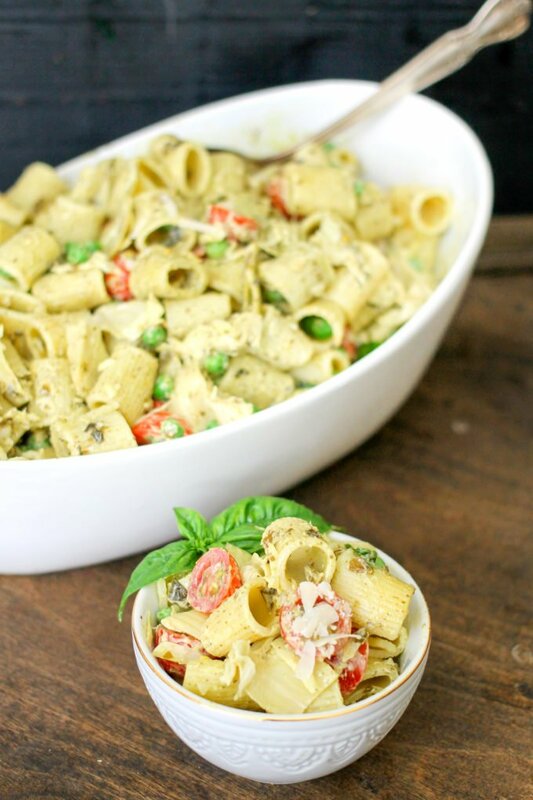 This Creamy Pesto Pasta is full of tomatoes, artichokes, peas, and topped with a creamy pesto sauce! It's sure to be a BBQ favorite! Cook pasta el dente according to directions, drain and set aside in a large bowl. In a small bowl mix pesto sauce and mayonnaise together and set aside. IN a large bowl or the same stock pot you used to cook the pasta, add pasta, peas, artichokes, and tomatoes. Pour pesto mixture over the top and toss to mix and coat evenly. Allow the salad to cool in the refrigerator for at least 20 minutes before serving, up to overnight. Garnish with additional cheese and fresh basil if desired. Serve and enjoy! 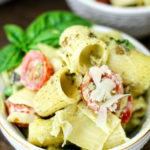 How do I make my own pesto? Hi Allyson, this summer salad looks so good! Thanks for sharing it looks like a winner. This looks delicious!! I totally need to try this! Pinned! Wow that looks so yummy! Found you over on the Tumble Weed Contessa’s linky party. I'll have to try your version-soon! I love anything with pesto in it. Pinning this one for later! I’m over here from My Turn (for us) Link up! Why is it that salads always, look, sound and taste so much better in the summer? Thank you for coming by and sharing this on Fluster Buster’s Creative Muster Party. Great idea for summer time gatherings or for a take to work lunch. Thanks for sharing at What’d You Do This Weekend. Best wishes for tasty dishes this week! Yummy! This looks amazing! I pinned and can’t wait to try it! Featuring you on Thursday from last week’s party. Thanks for sharing at Pinworthy Projects. Thanks!! I am going to give you a big shout out on facebook! This looks yummy! Perfect for a summer get together. I’ll definitely have to try this! I love this recipe. Have used it at BBQs 3 times now, and each time it was a great success. It’s really easy and can be prepped in advance. I roasted the cherry tomatoes in the oven for 20 mins before throwing in the salad though to add a bit more flavour. Wow, that sounds like a great idea! I will have to try that next time! Thanks for sharing! I love the idea of making this a day ahead and having it all ready to go! Looks fantastic! This looks so yummy! I cant wait to try!! Ohhhh boy! This looks like a winner to me! I have some fresh garden tomatoes and basil. I know what I will be making. I love pesto! This sounds so delcious! This will make a great addition to our BBQ!